The original Catholic church in Alameda began as the Mission known as Nativity of Our Lady (or Alameda Chapel of the Immaculate Conception). It was originally located east of what is now the Alameda bridge and just north of the present day intersection of Rio Grande Blvd. and Alameda Blvd. A flood in 1903 destroyed the church, and the present day Nativity of the Blessed Virgin Mary at 4th Street and Alameda Blvd. was completed in 1912. 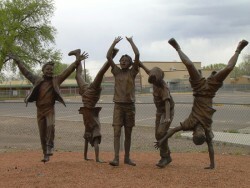 The “Olympic Wannabes” bronze sculpture by world-renowned Glenna Goodacre. It is located at the NW corner of 4th Street and Alameda Blvd. near the Alameda Elementary School. Ms. Goodacre is best known for her sculpture for the Vietnam Women’s Memorial in Washington, D.C. It depicts three uniformed women with a wounded soldier. The woman looking up is named Hope, the woman praying is named Faith, and the woman tending to a wounded soldier is named Charity. A tribute carving in a dead cottonwood tree stump of Nuestra Senora de Guadalupe (Our Lady of Guadalupe) located along North Guadalupe Trail. 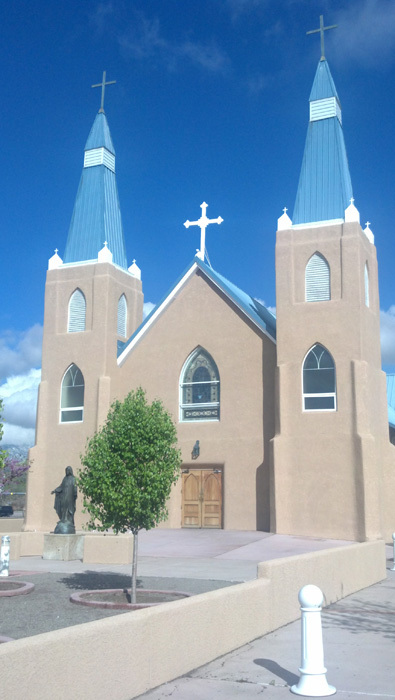 Alameda was the name given by early Spanish settlers to a Tiwa pueblo on the west side of the Rio Grande. Translation means something like “park” or “shaded walk” in Spanish. 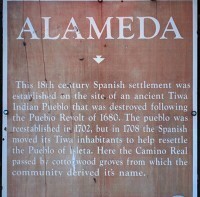 The pueblo was located about where Alameda Elementary School is now (4th Street and Alameda Blvd.). Note that today the riverbed runs west of where the pueblo was located (see below.) Records from Spanish explorers in 1583 describe the pueblo as 7 1/2 to 8 leagues above (upstream of) Isleta Pueblo. Historical accounts of pre-European settlement in the Alameda area are broadly based on descriptions that a Tiwa pueblo existed here prior to the Pueblo Revolt of 1680. Further, the accounts report the pueblo was destroyed during the Pueblo Revolt period. Then the displaced Native American inhabitants re-settled in the area now encompassing the Pueblo of Isleta, about 25 miles south of Alameda. The area now delineated as Bernalillo County in central New Mexico was once divided into at least twelve Land Grants. Along the Rio Grande valley portion of Bernalillo County the land grants were from north to south, Town of Alameda, Elena Gallegos, Town of Candelarios, Town of Atrisco, Albuquerque, Pajarito and the Pueblo of Isleta. Immediately to the north was the Pueblo of Sandia. The Town of Alameda Grant was awarded by the Governor Jose Chacon Medina Salazar y Villasenor on January 27, 1710. The grant was petitioned by Fransisco Montes Vigil, who had settled the area after emigrating from Zacatacas, Mexico in 1695 and, “since that time, he had participated in all efforts to pacify the Indians” (Bowden, J.J. 1969. Private land claims in the Southwest. ), as well as continuously cultivate the land. The original grant was approximately 100,000 acres in size. Exact boundaries are difficult to define because the main landmark, the Rio Grande, was a turbulent and wandering river. According to records the river changed course numerous times over the three hundred-plus years European settlers have settled here. It went from flowing directly south along the eastern bluff near the railroad tracks to its present course. Visit the Alameda North Valley Association web site for information about the area and current issues in the north valley. Many thanks to the Association for helping sponsor this tour! Visit the beautiful Bachechi Open Space, 27 acres located right next to the Rio Grande bosque and Rio Grande Valley State Park. 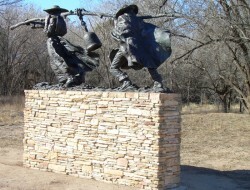 The “Bell Keepers” bronze sculpture by Las Cruces artist Bruce Papitto. It is located at Rio Grande Blvd. and Alameda Blvd. 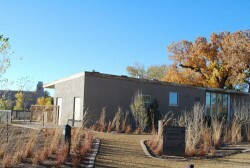 in the northeast corner of the Alameda Bachechi Open Space regional park, and was paid for by Bernalillo County’s one percent for the arts program.